The International Olympic Committee has banned Russia from competing at the 2018 Winter Olympics in Pyeongchang, South Korea. However, the IOC's vote Tuesday allows for individual Russian athletes "under strict conditions" to compete under the Olympic flag. 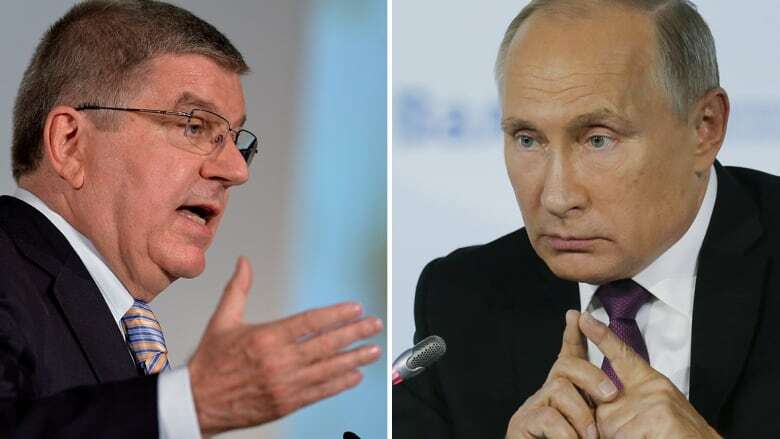 IOC President Thomas Bach, left, was part of the executive board that suspended Russia from the 2018 Winter Olympics, but is allowing athletes to compete as neutrals. Russian President Vladimir Putin, right, has previously said his country would boycott the Olympics if such a sanction was imposed. Russia could refuse the offer to compete as neutrals and boycott the Games, which are scheduled for Feb. 9-25. Russian President Vladimir Putin has previously said it would be humiliating for Russia to compete without national symbols. Canadian lawyer Richard McLaren, who investigated state-sponsored doping in Russia on behalf of the World Anti-Doping Agency, told CBC News there's a "high probability" that Russia would boycott these Games and prohibit any of its athletes from competing. "We've never seen this kind of extensive sanctioning of a country and the officials within a country, McLaren said. "I congratulate the IOC in its decision. It confirms my findings in the investigation that I conducted for WADA." The IOC suspended the Russian Olympic committee and IOC member Alexander Zhukov, and also banned Russian Deputy Prime Minister Vitaly Mutko from the Olympics for life. Mutko was the sports minister in 2014 and is the head of the organizing committee of soccer's next World Cup. The IOC also imposed a fine of $15 million US on the Russian Olympic committee to pay for investigations into the case and toward future anti-doping work. Canadian Olympic Committee president Tricia Smith was pleased with the decision to ban Russia. "We are encouraged and hopeful that the sanctions announced today by the International Olympic Committee [IOC] will bring forward positive change for clean and ethical sport," Smith said in a statement. Chris Overholt, the CEO and secretary general of the COC, added that "the IOC has done essential work on this issue today. The Canadian Olympic Committee will continue its efforts in collaborating with Canadian and world leaders for clean sport." After the decision was announced, Zhukov said Russia's athletes need time to consider whether they will take part in the Games. He added that they plan to discuss it Russian sports officials and athletes at a forthcoming meeting before a final decision on participation, but didn't give a date. Zhukov painted the ruling as a compromise, saying "there's positive and negative sides," and praising the IOC's decision to use the term "Olympic Athlete from Russia" for Russian competitors under a neutral flag. Previously, suspended countries have used terms such as "Independent Olympic Athlete," which was used last year for Kuwaiti competitors at the Olympics in Rio de Janeiro. Zhukov said "they'll be called Russian athletes and not some kind of neutrals ... that's very important." Former NHL player Ilya Kovalchuk said Russia must go to the Olympics despite not being able to use its national flag at the Pyeongchang Games. Kovalchuk tells Russian news agencies that a boycott would not work. He said, "refusing means giving in" to what he terms political pressure. "Patriotism and love for your country, it's in your heart," he said. "For that you don't have to shout or even wear the flag on your chest. And if, I hope to God, we manage to compete well, then we'll definitely sing the anthem." Kovalchuk was named to Russia's pre-Olympic hockey team on Tuesday. Two-time reigning world champion figure skater Evgenia Medvedeva, who also appeared in front of the IOC board, wouldn't say if she'll compete as a neutral. "It will be discussed more and it's very early to ask questions like that," she said. "An Olympic boycott has never achieved anything," IOC president Thomas Bach said at a news conference. "Secondly, I don't see any reason for a boycott by the Russian athletes because we allow the clean athletes there to participate." The Russian doping program caused "unprecedented damage to Olympism and sports," said IOC-appointed investigator Samuel Schmid, the former president of Switzerland who was asked to verify an "institutional conspiracy." Jack Robertson, who until 2016 was WADA's chief investigator and helped expose Russia's doping program, said it is a "farce" that Russian athletes will be allowed compete under a neutral banner. "This is a farce and the IOC knows it," Robertson wrote in an email to The National's Adrienne Arsenault. "There is absolutely no sure way to 100 per cent differentiate between clean athletes and doping athletes. "If there were, then doping would have ceased long ago." Robertson called the ruling a "betrayal" to clean athletes. "I deeply regret we fell short in making this a cleaner field. [They] deserve better," he wrote. The International Paralympic Committee (IPC) is expected to make a decision on whether to ban Russian athletes for the Winter Games next March. The IPC did banish Russia from the 2016 Paralympics in Rio. The executive board reached its decision Tuesday after a scheduled 4½-hour debate when it heard from a Russian delegation that included world figure skating champion Evgenia Medvedeva. The delegation was led by Zhukov, who was later suspended. Two IOC commission leaders — appointed after World Anti-Doping Agency investigator Richard McLaren upheld Rodchenkov's doping claims in July 2016 — also reported to the Olympic board. Schmid's report included a 50-page sworn affidavit from Rodchenkov, who was also a key witness for McLaren and an IOC disciplinary commission. Any sanctions imposed by the IOC can also be challenged at CAS, and later at Switzerland's supreme court, which can intervene if legal process has been abused.